Attention Olin-Dwellers: Things Are Improving! The sign, in all its glory. WHAT DOES IT MEAN?! Learn more after the jump. Odds are, you probably aren’t sure of how a change in our college’s book-delivery vendor of choice will directly affect your life (spoiler alert: it probably won’t). I wasn’t clear on that either, until I spoke with Humanities Librarian Nina Clements and Library Services Supervisor Jennifer Beck, who were nice enough to tell me something (okay, everything) about the ins and outs of the new system. 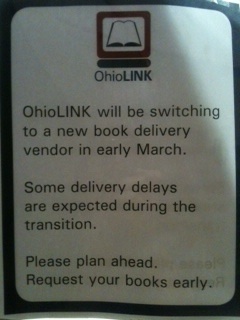 According to Clements, our previous vendor, OhioLINK–a consortium of nearly 100 Ohio college and university libraries that work together to provide information–recently terminated its contract with Kenyon. OhioLINK is currently working with our new and improved provider, Priority Dispatch, to get Kenyon through the transitional period until Priority Dispatch officially takes over on its own on April 16, 2012. Hey, less e-complaining has to be a good thing, right? Unlike OhioLINK, Priority Dispatch sorts deliveries through a barcode system, rather than having people manually check each package, which will hopefully increase efficiency.